PORTEmaus: Is it too Late to add This to my "Best of 2010" list? Is it too Late to add This to my "Best of 2010" list? To better understand the book or the documentary, you have to experience them both. 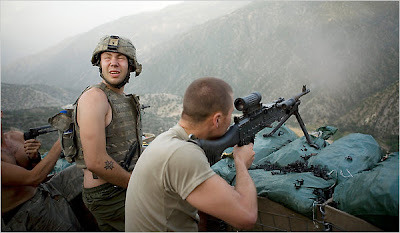 Sebastian Junger's book war lays the groundwork for the collaborative documentary, Restrepo and the film fleshes out a lot of the testimony given in the book. This kind of makes a review of simply the film difficult especially since a lot things such as the mention of PFC. Vismoto's death is a minor issue in the film. To say the very least, if you have already done one (read the book or saw the documentary), you should do the other... You will not be disappointed. The focus of Restrepo is the Second Platoon of Battle Company (Official Army designation: Second Platoon, B Company, 2nd Battalion, 503rd Infantry Regiment (airborne), 173rd Airborne Brigade Combat Team) being sent to the most dangerous region of Afghanistan, the Korengal Valley. During this deployment, two journalists were embedded with them, Sebastian Junger and photojournalist, the late Tim Hetherington (Who was killed during the Libyan Conflict of 2011). The bulk of the film discusses the level of interaction with Taliban fighters and the futility of trying to win a war where the population refuses to work with foreigners. 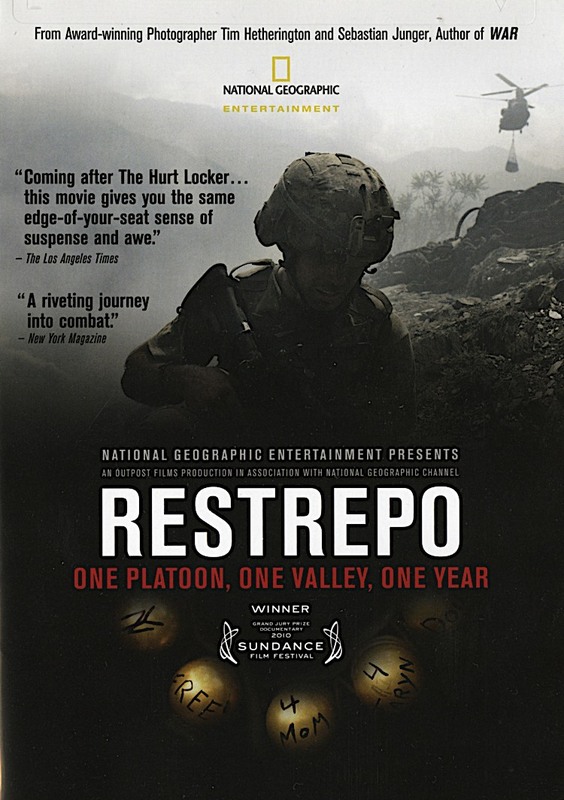 The film also highlights the construction of OP (Observation Post) Restrepo which in the words of one of the interviewees, "changed the tone of the Korengal." Restrepo is a solid documentary through and through. Regardless of one's stance on the war in Afghanistan or anywhere else, it provides a first hand glimpse into what is going on there. Afghanistan has the long been the forgotten war here in the states with Iraq dominating much of the television coverage. This of course has changed but there still a lot that people do not know much about the war that has lasted a decade in south-central Asia. An example of this is the mission codenamed: Operation Rock Avalanche. With the emotional response from those interviewed, this obviously left a deep emotion scar (Especially, the loss of the most respected soldier in the platoon) among those who participated in the operation. Rightly so, considering this is war. It is troubling that the struggles of Second Platoon went unnoticed during the bulk of their fifteen month deployment in the most violent part of Afghanistan. Thankfully, Sebastian Junger gave us War, which gave us a textual glimpse into the war forgotten by much of America (That is the downside of having two simultaneous and continuous wars... Speaking of which, what is happening in Iraq these days?). It is one thing to read about it but it is quite another to experience it visually. Documentaries such as Restrepo is the closest that many of us will come to actual combat but more importantly, it is the closest that we will get to an actual view of what is happening with Afghanistan. Labels: Battle Company, Restrepo, Sebastian Junger, Second Platoon, Tim Hetherington, War.